I decided to finally convert to USB lights for my daily commute (around 35kms/day) and picked up a couple of these lights, as they seemed to have a decent battery life between charges. They're very light weight and come with a simple o-ring mounting (and also can fit the standard mounting that came with my Cateye battery lights). Plenty of brightness for city commuting. I use the flashing mode and am getting well over 2 weeks between charges, which I think is pretty good. 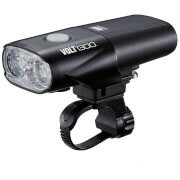 Overall a good value light. Very good value. Fairly easy to fit (although a tight band can make it a little tricky). So far I haven't had to recharge (perhaps 8 hours use) so I can't comment any further on its longevity.